Valentine’s day is all about giving love to others. We also think it’s important to give love to oneself and it was this thought that inspired our Treat Yo’ Self herbal soap making workshop. 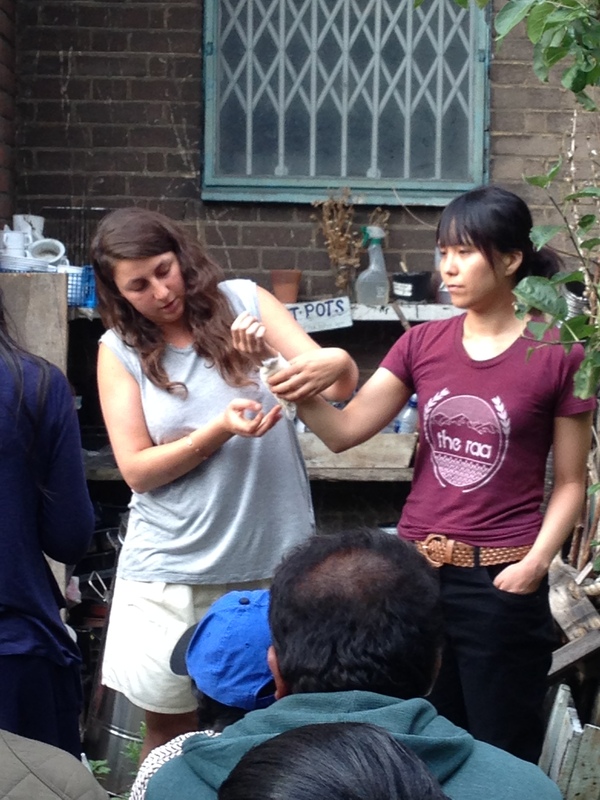 And so for the afternoon of Feb 14th we transformed the classroom at Hackney City Farm into our soap-making laboratory. Here’s what we got up to! 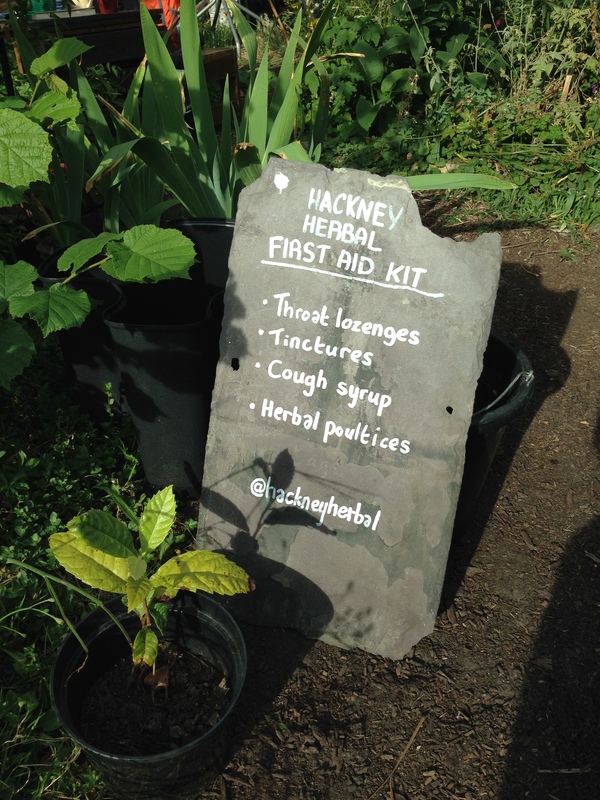 Hackney Herbal are available for private workshops and events so do get in touch if you would like to work with us! A special thank you to Glenn Jeffery for taking all these lovely photos. Way back in mid-summer sometime, we attended a ‘Get Ready for Urban Food Fortnight’ event hosted by organisers Sustain. During the evening, we received tips about how best to tackle the 2-week event, which included the advice: “Don’t take on too many events”. I think we may have ignored that one. Here is a round-up of what has happened so far! We were lucky enough to meet Gosnells, London’s first mead brewery (a.k.a. meadery), through yet another one of Sustain’s pre-UFF events. 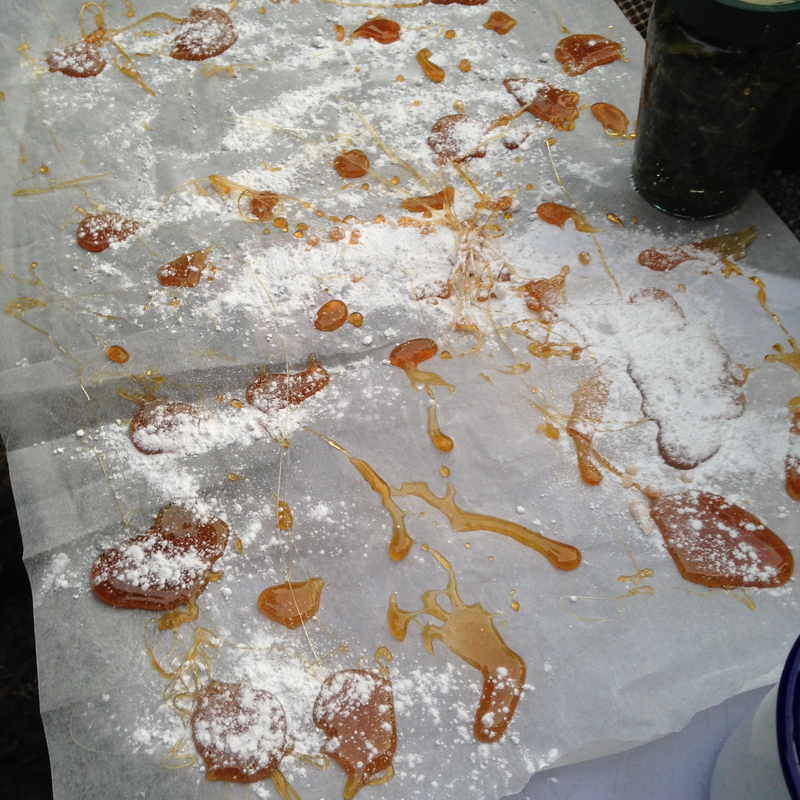 This resulted in the creation of meads infused with herbs grown by our partner sites across Hackney! We celebrated our minty meads with an event at the Gosnells Peckham site. 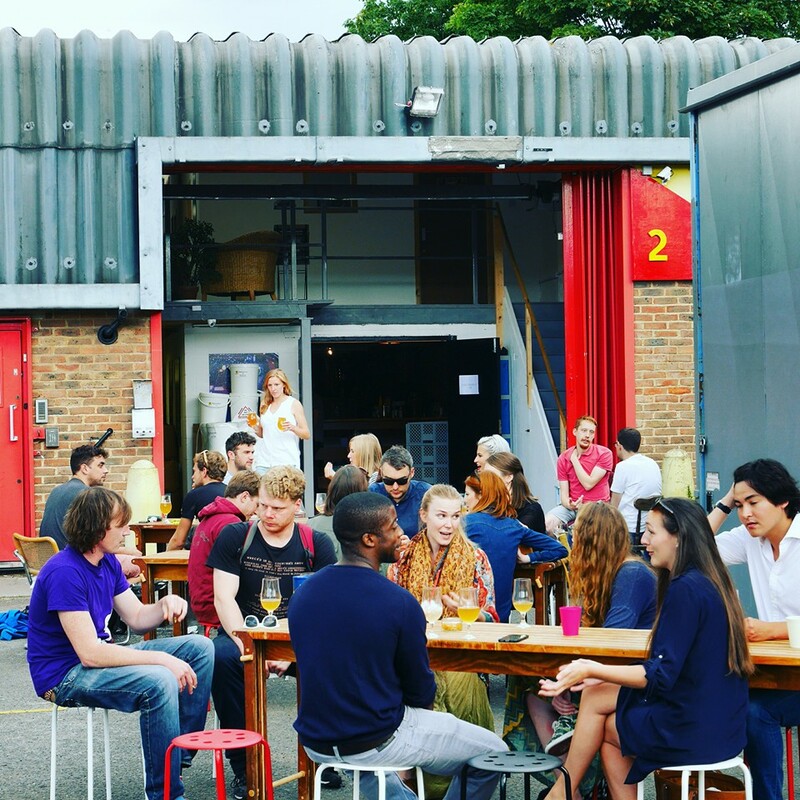 Don’t worry though, you can still try their awesome Orginial and if you’re lucky, Mint Mead at their site at: Unit 2, Print Village, Chadwick Road, London, SE15 4PU. Check their Facebook or website for more details. 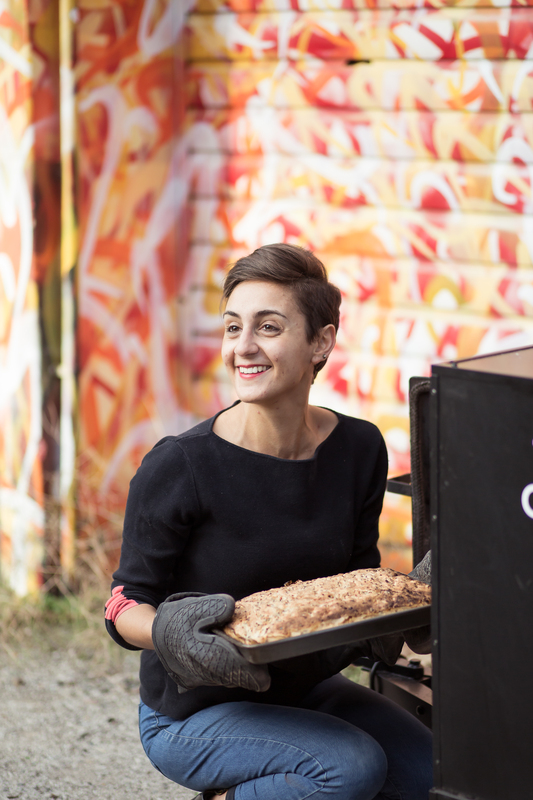 A collaborative workshop between Hackney Herbal and The Bread Companion – the nomadic micro-bakery. 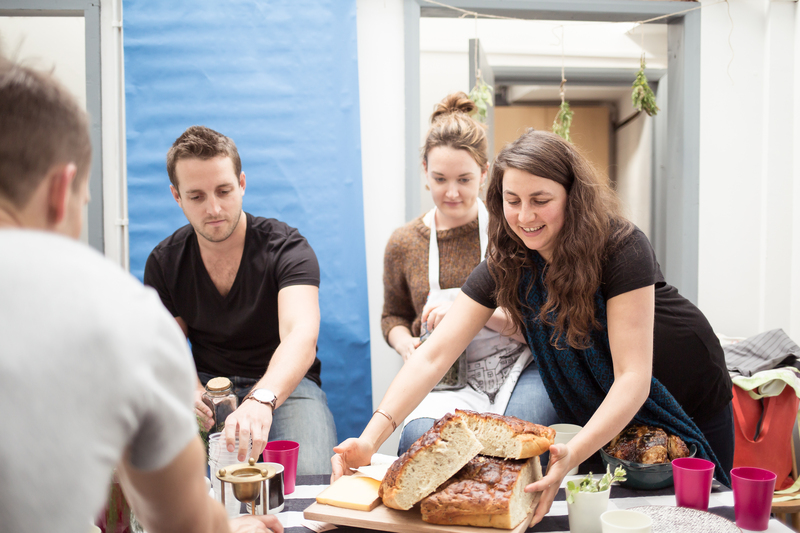 Hosted at Julia’s (The Bread Companion) studio near London Fields, attendees learned the essentials of how to make their own bread from learning about ingredients to the ‘baker’s percentage’, from enriched dough to baking in a brick oven. Herbs and bread are natural companions so we made lavender dough and rosemary focaccia. Lavender: Used to soothe, sedate and suppress. A drop of oil on the temple can relieve headaches and can also soothe skin complaints, inflammation and rheumatic aches. Rosemary: Oil contains anti-bacterial and anti-fungal properties. Makes a good mouthwash and stimulates the smooth muscle of the digestive tract. After lunch and whilst dough was proving, we launched into an introduction to herbs, focusing on the constituents of our ‘Reflection‘ blend: fennel, rosemary, lemon verbena and peppermint. Designed to aid both mental (rosemary and lemon verbena) and physical (fennel and peppermint) digestion. The session culminated in the design and creation of personalised herbal tea bags. It had been raining all day. We were all damp but we had an event to organise! We weren’t going to let a little bit of British weather ruin our vision for a herbal haven in a working polytunnel of Hackney City Farm. Our lovely attendees fought through the grim weather and made it to the farm. We warmed them up with steamy cups of the herbal ‘Reflection’ blend and they tucked into nibbles including sourdough provided by social enterprise Better Health Bakery. Thankfully, the rain eased in time to start the workshop and we were able to hear Nat without the pitter-patter of rain on plastic sheet. Through facts, myths and legends, we told the story of herbs and their importance to humans throughout history. Memorable anecdotes and surprising revelations punctuated the evening, hopefully adding substance, wonder and a little magic to people’s understanding of herbs. As the evening’s light faded, we were plunged into darkness. With only candlelight and the hum of traffic from Hackney Road getting ever more distant, we learned of the methods employed to best dry and store herbs. Herbs strung up to the metal skeleton of the polytunnel demonstrated a common and simple drying method. Jars on the table featured an attractive way to store (and display) dried herbs. We moved indoors for the final instalment of the evening and where attendees received their herbal tea starter kits (including muslin, string, tags, feverfew and calendula seeds). Now they have no excuse! Here’s to home grown herbal tea! 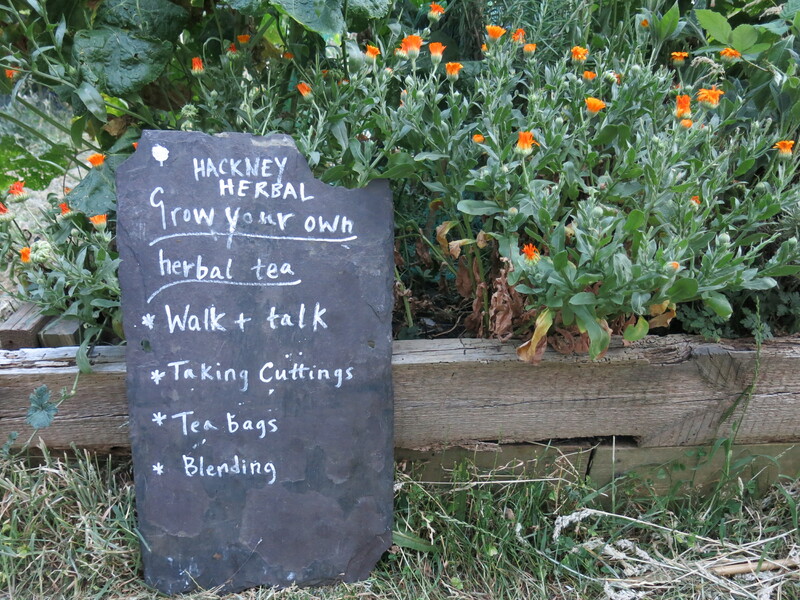 Sunday the 27th September 2015 | Herbal Tea Party – A free event held on Gillett Square celebrating the successful launch of Hackney Herbal and mark the end of Urban Food Fortnight 2015. Click here for more info. 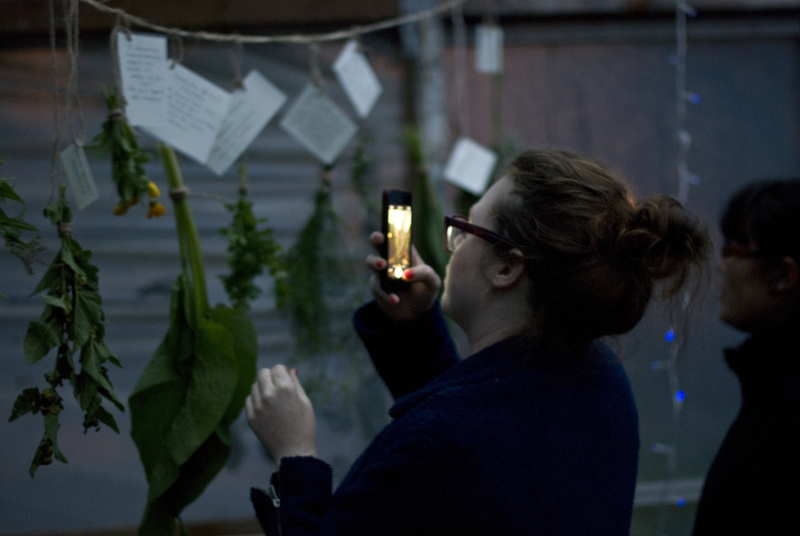 Thank you to Kat for photographing An Evening of Herbs and both her and Fran’s help on the day. Thank you to Steve for your hard work at Bake and Blend 2.0. Last week we had a busy Thursday evening at Cordwainers Garden cooking up recipes for our homegrown herbal first aid kit. 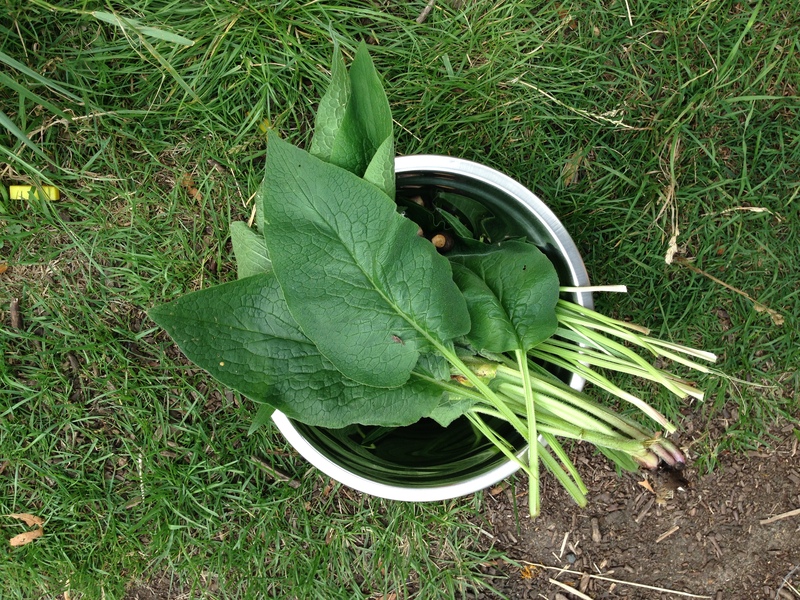 We picked mucilage-rich herbs (comfrey root, marshmallow and plantain) from which we made a decoction, the base for our cough syrup and lozenges. These herbs act to soothe inflamed membranes and so make a perfect base to create throat soothing concoctions. We also had a go at making poultices with comfrey and yarrow and tried these out on some willing volunteers who had some (slightly) injured limbs. You can make a poultice with either fresh or dried herbs. Cut up the herbs and mix them with a little hot water to make a paste. Spread the herb mix onto gauze and apply to the skin. Cover with a cotton cloth and leave on until it goes cool. Repeat as necessary. 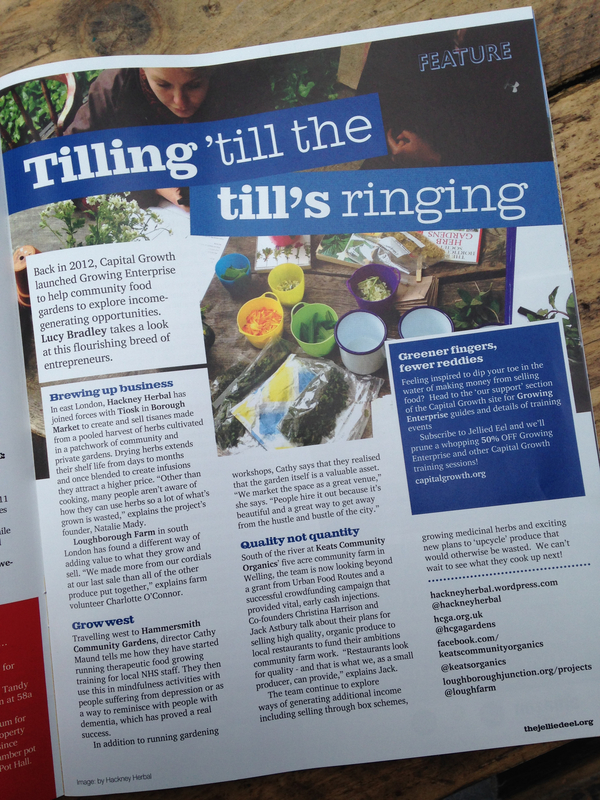 If you are a Jellied Eel fan, you may have spotted us in their latest magazine edition featuring growing enterprises in London. 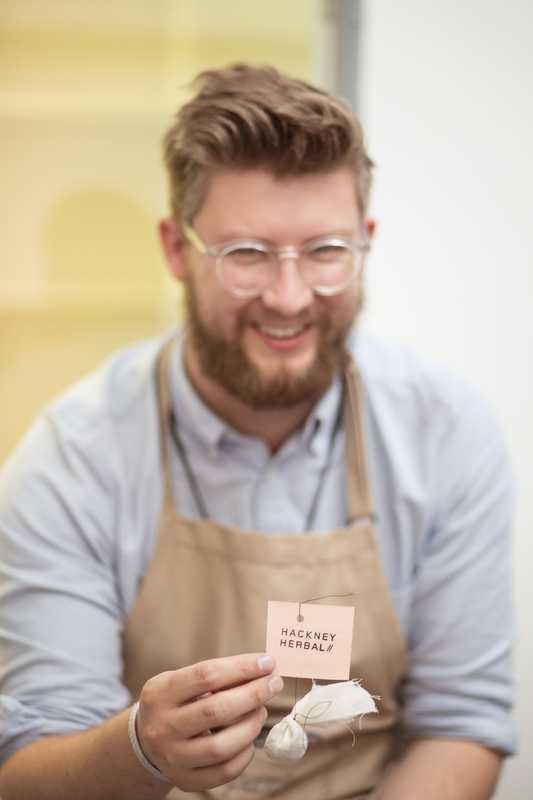 If you’d like to taste some of our home-growns head over to Tiosk on Broadway (not Borough) Market, now stocking a blend made with herbs grown exclusively at sites in Hackney. The proceeds of this will go towards our next series of herbal well-being workshops in partnership with the Centre for Better Health. 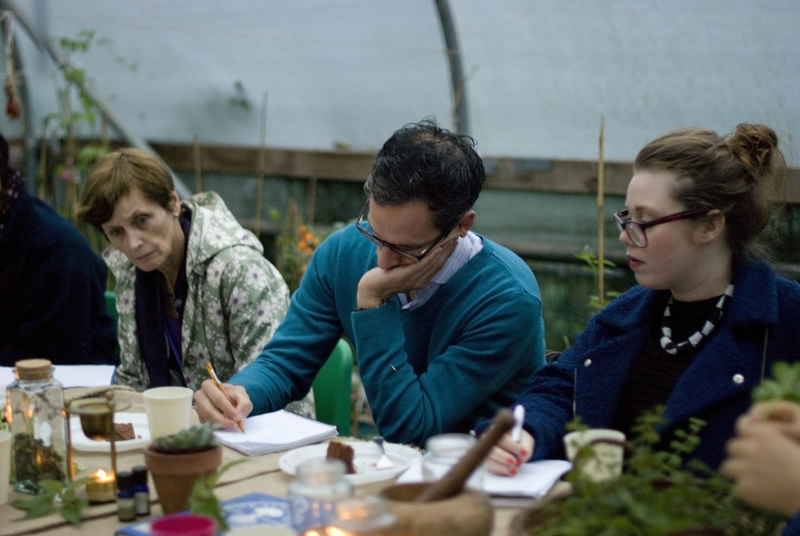 As part of Urban Food Fortnight we will be running a special herbal evening event at Hackney City Farm. More details and booking information here. Now is good time to be harvesting one of my favourites, Achillea millefolium, commonly known as yarrow. 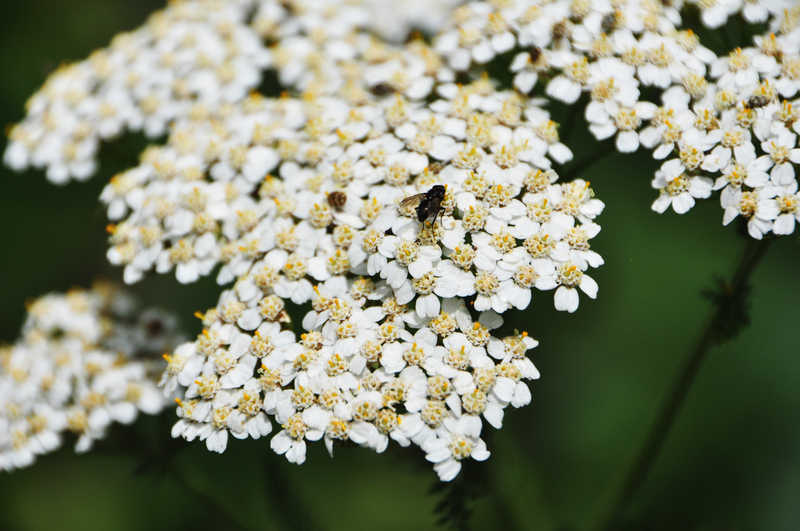 A herb that anyone accident prone will be drawn to, yarrow is what we call a wound herb. It takes its name from the Greek hero Achilles who, legend has it, would carry bunches of yarrow to treat fellow soldiers on the battle field. It acts as a hemostatic agent and therefore helps to staunch blood flow. I’ve never had a nosebleed but when I do I plan to shove a sprig up my nose. A tea made from the plant has anti-inflammatory properties and will help to reduce swelling. So, rather good that it has a tendency to plant itself in grassy areas making it on hand for those unintentional tumble and falls. 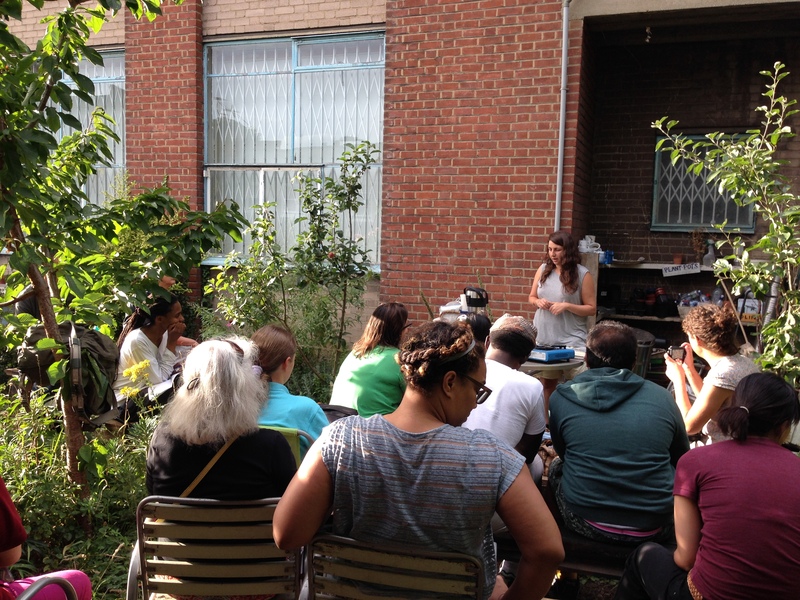 Thursday evening marked the first of our Grow Your Own Herbal Tea events at Cordwainers Garden – a beautiful oasis providing calm away from the bustle of Mare Street. Not only was the weather on our side with warming June sun rays beaming down on us but the turnout was good too! This made for a very special evening starting with a herb walk and talk around the garden led by Nat. As we snaked through the plots, Nat pointed out some common and lesser known herbs, explaining their histories, properties and uses. All the while, cuttings were being taken in preparation for ‘megamix’ herb blend we’d be tasting later! The next part of the workshop focused on how to propagate plants from cuttings – an easy way to save money on buying new plants and an interactive way of understanding more about the biology of plant growth! Then it was break time. We sipped some ‘megamix’ herbal tea and had some herb-based discussion before turning to the last task – herbal tea bags. Great as a personalised gift, herbal tea bags are simple to make and even more unique when filled with herbs you have grown and harvested yourself! Growing in small spaces in the city can be done and most herbs make great container plants. 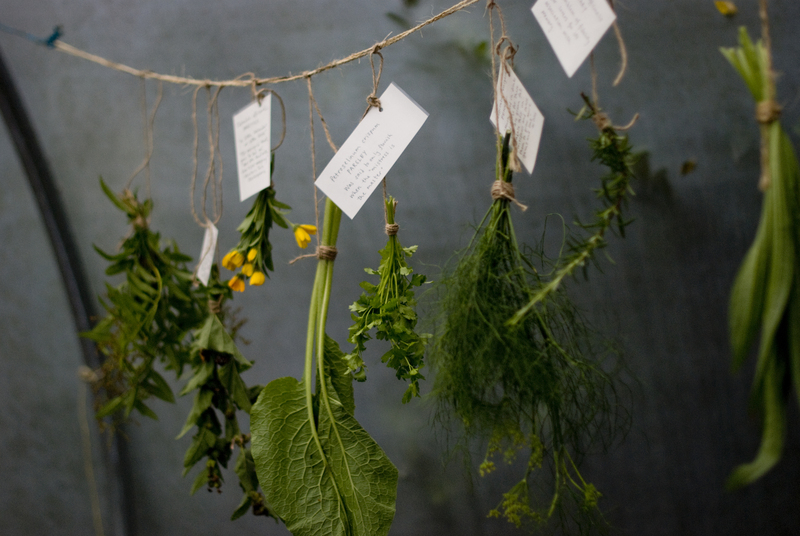 Harvesting and drying your herbs are simple as well – stay tuned to Hackney Herbal if you’d like to learn more! A Quick Update on Events in June! Natural Cosmetics: Make Your Own Lipbalm and Body Scrub Workshop, Weds 17th June 18:30 – 20:30 [Free Event] Location: Wilton Estate Community Hall, E8 1BE – the community hall is located in the middle of the estate next to the sports court. Join us for a workshop exploring natural cosmetics made from herbs. We will be looking closely at the use of Calendula officinalis (Pot Marigold). Make your own lipbalm and body scrub to take home! Grow Your Own Tea, Thurs 25th June 18:30 – 20:00 [Free Event] Location: Cordwainers Garden, next to the London College of Fashion, E8 3RE – turn immediately right as you enter the gates and follow the grass with the building on your left. You may have a herb pot next to your front door or perhaps a garden with some treasures to be discovered! This free workshop will give you an introduction to some well-known as well as common but little-used herbs and their beneficial properties. A herb walk and talk will help identify herbs and learn about their history, folklore and uses. You will learn how to make the most of your herbs through an introduction to harvesting, drying, storage and propagation. We will also do some tea blending and tasting where you can do some of your own experimentation and discover the variety and richness of herbal tea. What’s more, you will be taking home a free pack of Calendula seeds!